14 March 2017. An academic-industry team found a smartphone app can reliably collect data from people with asthma about their conditions, but some limitations remain. Researchers from Mount Sinai medical school and mobile health systems company Lifemap Solutions, both in New York, report their findings in the 13 March issue of the journal Nature Biotechnology (paid subscription required). 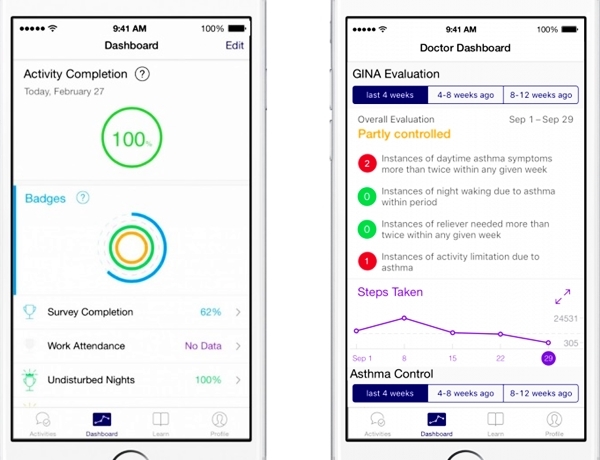 The team led by Mount Sinai’s director of genomics Eric Schadt, who also has degrees in mathematics and computer science, evaluated a smartphone app developed by the medical school with Lifemap Solutions to collect data directly from people with asthma about their conditions, as well as their medications and environmental factors that may contribute to their experiences with the disorder. Asthma is a chronic condition where the airways become inflamed and narrow, causing people with asthma to experience wheezing, shortness of breath, tightness in the chest, and coughing for periods of time. Centers for Disease Control and Prevention estimates that in 2010 some 18.7 million adults had asthma, along with 7 million children. The mobile app, developed by Lifemap for Apple iPhones acts as a data collection tool as well as an educational medium about asthma in general and the user’s own condition. The app collects data on asthma symptoms, use of medications including inhalers, and medical attention received. The software also records input from participants from environmental conditions that trigger asthma attacks, such as colds, smoke, pollen, and animals. In addition, the iPhone’s activity tracker shares data on physical activity, which may also trigger attacks. The app was designed with Apple’s ResearchKit that provides modules for tracking activity, conducting surveys, and gaining user consent. Mount Sinai began the study and introduced the app in March 2015, resulting in a flurry of nearly 50,000 downloads, but only a fraction of which — about 7,600 — in the U.S. actually enrolling in the study. The school reports the vast majority (85%) of study participants completed at least 1 survey presented by the app during the 6 month period, but only about 2,300 of those individuals completed multiple surveys, and are considered the hard-core group. Schadt and colleagues collected data from app surveys, as well as locations of the participants from their iPhones, and simultaneous reports on air quality and pollen levels from those locations. The team correlated data from the app with the environmental reports, and compared the results with findings from existing asthma studies. The authors conclude that mobile apps are a feasible way of collecting reliable information from individuals on chronic conditions, such as asthma. Data from the apps corroborated findings from local reports of heat and pollen, and matched peak air flow rates found in conventional studies. Even local hazards, such as dangerous air quality levels from wild fires in Washington State, correlated with increased asthma symptoms from the app. The authors still note some limitations with mobile apps, beginning with low retention rates and potential selection and reporting biases. In addition, maintaining security for data collected through the apps is a continuing concern.